I'm not sure if I'm posting this in the right place..."in loving memory" is where I'm trying post but didn't see an obvious reply to post so perhaps I have no posting access yet. I'm new to VH and pictures is what I do to remember the victims. I looked at so many pictures of Zahra, I loved this one as it shown her light the brightest. Rest in peace precious child. Silvahalo . It is fine to put a in loving memory of Zahra here. You just started your first topic. Congratulations. If I have not already welcome you I want to now. Zahra deserves every picture posted of her! Thank you so much for finding us. Welcome to the club. What a wonderful tribute. Im so glad you care so much. You do beautiful work!! Welcome to VH Silvahalo! What a beautiful picture of a beautiful little girl who was let down by all the adults around her. OMG, LM! I am not ready for this but for posting it! I know wrap. Zahra death really hit you hard. I remember. I feel like she deserves a thread like this one full of memorials. There really are no words to describe what that poor child endured. I think there are many that were hit hard by not only her death, but what was done to her. It's EVIL! And, I agree. Let's do a thread full of memories. Thank you LM. I am like Wrap though. This hits hard still. That precious little angel. The above and the tributes on the front page are hard to watch. I simply cannot "go there" yet. Thank you all so much, I love working on the pictures! So I started a new thread, lol. OK. well Zahra sure deserves it. I'm still getting the hang of things so excuse me stumbles! Not a problem, Silvahalo!!! I sent you a PM. Silvahalo Victims Heartland is what it is today because of new members like you. That come here and right away make a difference. Zahra case turned in to what we considered for mature content only. We always move those thread from public view. Kids are exposed to enough crime and evil without reading about it on VH. The very first thread you posted made a difference. I had neglected to get Zahra her own place in loving memory. I did that this AM and used the beautiful picture you made and brought here. Thank you. Thank you LM. I'm still not sure how to maneuver around her so don't be surprised as I post in the wrong place. I'm confused on the what the "portal" means. Any help at all is welcomed....and a thanks to everyone who commented...oh, is there a way to thank posts? Silvahalo, that is a terrific quote in your signature. I can feel the passion behind it. It’s been a year since all of North Carolina first got the Amber Alert that a freckle-faced, ten-year-old girl had disappeared from her northwest Hickory home. 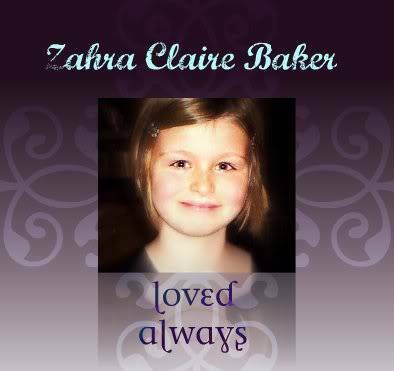 Even as the Hickory Police Department sent out the alerts for Zahra Baker late Saturday night, October 9th, 2010, they suspected the little girl’s father and step-mother weren’t quite telling the truth about her supposed abduction. Major Clyde Deal spoke to NewsChannel 36 shortly before the 11 p.m. news that night, saying investigators were getting conflicting statements from Adam and Elisa Baker. Police also thought it was suspicious that the young cancer survivor with a prosthetic leg and a hearing loss in both ears would leave without something she really needed. "The child is hearing impaired in both ears and her hearing aids were left in the house," he said that night. By the next morning, the Piedmont was learning Zahra’s story about her battle with cancer and her unshakable smile, as video from a Speedway Children’s Charities event flashed across their TV screens. In it, young Zahra was being fitted for the hearing aids Deal said she left behind. That morning, police led Elisa Baker away in handcuffs for outstanding warrants on unrelated charges, and she would later admit writing a fake ransom note about Zahra’s supposed abduction. Hickory Mayor Rudy Wright remembers watching the story unfold and thinking that cases like these rarely end well. "It became more heartbreaking that she had overcome more in her short life than most of us will have to endure if we live to be 100," he recalled. But the little girl’s story touched a lot of hearts in Hickory. Over the next few weeks, Wright saw the town pull together. “I learned a lot about people -- about how giving and caring they are,” he said. People called in tips about where they’d last seen Zahra, and dozens left flowers and stuffed animals next to a tree in her front yard along 21st Avenue NW. A little more than a month later, police chief Tom Adkins addressed the media again -- but this time his voice cracked as he announced the Amber Alert was cancelled. “This has turned from a missing person's case to a homicide,” he said. Part of Zahra’s prosthetic leg, found in the woods, had been positively identified. Zahra Baker’s biological mother, Emily Dietrich, had traveled from her native Australia to Hickory for the announcement. She had given custody of Zahra to Zahra’s father at birth because of post-partum depression, and had been trying to find her for years. She found out where Zahra lived just a few days before she disappeared. She visited the memorial tree, grief-stricken, but comforted by the outpouring of support for her daughter. The house is now boarded up, and the tree has been cut down. Elisa Baker has pleaded guilty to second-degree murder and other charges, and is headed to prison. Police said they can’t find evidence that Adam Baker was involved in Zahra’s death. He still faces charges for identity theft and obtaining property under false pretenses. Mayor Wright said he’s proud of the people of Hickory for their support, and for wanting to remember Zahra Baker in a positive way. A playground for children of all abilities is in the works at Kiwanis Park. Organizers have received nearly double the amount of money they expected in donations – more than $170,000. The park should be open by spring. Wright said he expected nothing less of the people of Hickory. What a wonderful tribute to a beautiful little girl. A new law goes into effect today that makes it illegal to dismember or desecrate a body to conceal it from the police in North Carolina now which was triggered after little 10 year old Zahra Baker was killed and her body was dismembered and her body parts were scattered out in order to cover her murder up. To be perfectly honest I don’t understand how come it has to be written in the laws that cutting up someone’s corpse would be illegal, it should automatically be known to be against the law. It just doesn’t make any sense to me. Elisa Baker was charged with second degree murder after doing this to her step-daughter, but would she have been charged differently had she not cut the body up? I doubt that because murder is murder no matter what. Cutting that child up as she did only showed more disrespect to the dead than ever, if you ask me. But what would have been the difference in her sentencing had the law been valid at the time? District Attorney Jay Gather said it could have added 7 more years of jail time for Baker, but in all honesty for what this woman did, she should have gotten life without benefit of parole. Actually death would be more appropriate, and that is without this new law. The same goes with the Caylee Anthony law making it illegal to wait to report your child missing more than 48 hours after they were last seen. Well common sense should tell any parent not to wait one hour much less 48 hours to call 911 if their 2 year old child disappears and you have no idea where they are. Why does there have to be a law saying that you have to in order to stop it? What is wrong with people these days? Adults that do things like this are worst than a child being told they can’t have a cookie yet they grab one anyway. Although I know the intentions of making these new laws are meant to help but do we really think it will make a difference? If the law said you have to report your child missing within 48 hours in Florida, do we really think Casey would have obeyed the law? 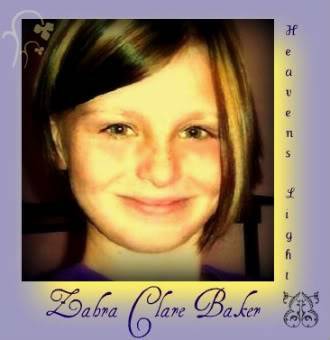 Would Elisa Baker have reconsidered dismembering little Zahra’s body, before disposing the parts, if the law would have been in effect that it was against the law? Unfortunately I don’t think so. After all, murder has been against the law since who knows when, yet someone kills someone everyday, and it being against the law doesn’t stop them. I don’t know what makes someone want to kill another human being, but it really is hard to understand how a mother or father could possible kill one of their own children. Children are given to us by God as a gift to cherish, not to abuse or harm. With the Christmas season approaching us I would like to send my well wishes to the families that have lost a loved one or that a love one has disappeared and not been found yet. It has to be hard normally but around the holidays it must be even harder and my heart does go out to all of you. Unfortunately the list is too long to name all of those still missing but I do still pray for all of them and the family they left behind to look for them. God bless all of them. The Real "welcome" goes to Jan Barrett. I just love her. She has a wonderful, kind, caring heart. I said as much to her on her blog. glad to see something good comming from this RIP SWEET ZAHRA sad this is how she had to make a difference in the world! Very special!! Thank you so much! !